As I continue to half-heartedly explore the ins and outs of Weight Watchers, Hunter has become my recipe guinea-pig. I've found some great tips and recipes via Pinterest, but my go-to recipe gal has to be Gina from Skinny Taste. Gina has some of the best recipes I've tried; they're easy, they have few ingredients (a must for me), and they never fail to taste good. However, tonight's recipe was not just good, it was AMAZING. Seriously. We both (along with Erin) decided it was really really great. So, what is this mystery recipe? 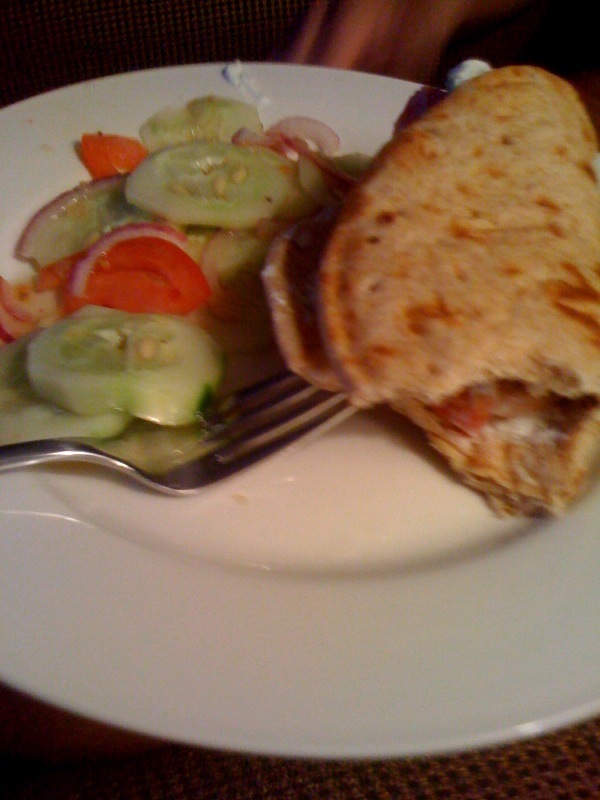 Greek gyros! I* used this recipe for Greek meatballs and this recipe for tzatziki then piled it on some flat bread with fresh tomatoes. As a side, I whipped up a quick tomato salad (tomato, cucumber, & red onion w/a few squirts of Italian dressing). This meal is a must try and will certainly become a part of our rotation. There was even enough to freeze! OPA! *Special thanks to sous-chef Erin for all of her fantastic chopping skills!